1) In the States, the American alligator is also called the Mississippi or pike-headed alligator. The word alligator comes from el lagarto which is Spanish for “the lizard”. American alligators, unlike the pretender, the American cockroach, of last week, is only found in the Americas. Specifically Alabama, Arkansas, North & South Carolina, Florida, Georgia, Louisiana, Mississippi, Oklahoma and Texas. For once mainstream cartoon charactateurs have it right as alligators do indeed live in swamps and marshes. However, their physiology enables them to tolerate a certain amount of salinity (salty water) for short periods meaning they are also found hanging out in mangrove swamps and areas of brackish water. More often though, second to swamps and marshes, the best place to look for gators is in rivers and lakes. The mounted American alligator skeleton (Alligator mississippiensis) on display at the Grant Museum. LDUCZ-X1294. 2) Ok let’s get down to the really important facts… how many big fat chompy teeth do alligators have? The number of teeth in adult American alligators can vary slightly, but the total number is between 74 and 80. They come in three morphologies, depending on where they are in the jaw; five pre-maxillary teeth (right at the front of the top jaw), between 13 and 15 maxillary (throughout the rest of the top jaw) and 19 or 20 mandibular teeth (all the teeth on the lower jaw). All in all, that’s quite a lot of teeth. An American alligator wallowing in a pool that is drying up. 3) Much like humans, if an environment is not perfectly suited to their needs, they’ll change it. Using their snout and tail, American alligators will dig ‘alligator holes’ which fill with water and give the gators ample pools to lounge about in. These pools also provide a refuge for other species (though presumably only when the alligator isn’t home) throughout drier periods. Once the pools dry out, the alligators simply move on, and they can often be seen crossing roads and wandering around suburban areas looking for water, and are often found sheltering from the heat in swimming pools. In areas where alligator habitat and human settlements are in very close proximity Nuisance Alligator Programmes are utilised (to catch alligators, not humans) which for a number of reasons, primarily large size, are deemed to pose a threat to people. Sadly, due to the alligators habit of finding their way back to their home range, relocating ‘nuisance’ alligators is not considered an option. These unfortunate individuals are therefore either sold to alligator farms or used for their skins, both methods of disposal help to fund the NAPs. 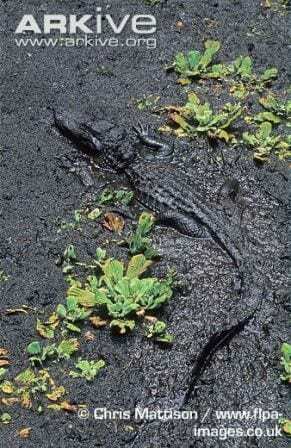 4) Like some bears and tortoises, for two random examples, American alligators see out the winter by hibernating. 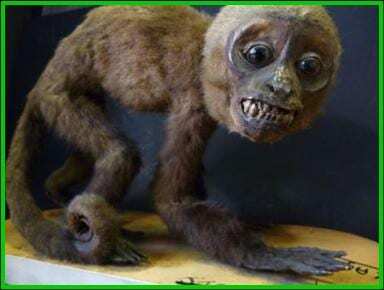 They dig dens using their snout and tail, as for their water holes. 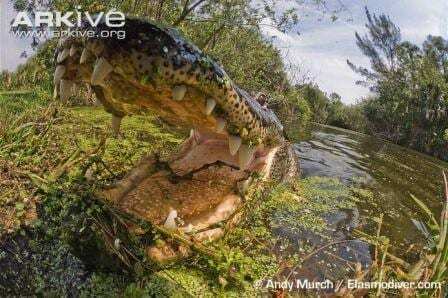 If there is a warm spell during the winter months, American alligators may emerge briefly, but they won’t eat in this instance as they have slowed their metabolic rate to such an extent to survive the winter, that they do not need to feed. A very close close-up of an American alligator. 5) If an adult alligator is submerged in water as it begins to freeze, it can survive as long as its nostrils are above the waterline, even if this means their entire upper body becomes trapped in the ice. If a gator becomes trapped beneath the ice, their ability to slow their metabolic rate means that they can survive for over 8 hours without breathing, assuming it is an adult. Bonus fact 6) If you aren’t sure how to tell the difference between an alligator and a crocodile, there just so happens to be a fog clearing explanation on our blog called What’s the difference between a crocodile and an alligator? Cool! I’d read elsewhere that they can’t tolerate sea water at all, unlike their cousins the crocodiles, who can. Something to do with not having salt glands. But spare a thought for the Chinese alligator, that is critically endangered and will probably be extinct in the wild fairly soon. Not necessarily from being served up on dinner plates, but from habitat loss and pollution. By comparison, the American alligator is doing very well.